Windows version may have issues on modern systems. GOG.com version has hardware mode disabled. Hardware mode can have issues with modern systems. Also included with the 1995 and 1998 CD versions. Only released as part of the 1995 and 1998 CD versions. The DOS version is played through DOSBox and has a unique dynamic soundtrack (iMUSE) that is not available for other versions. The Windows version features 3D-acceleration support, textured models and increased resolution and is moddable to support higher resolutions and framerate. The original release comes on 5 floppies and runs at 320x200 resolution while the collectors CD-ROM features a 640x480 mode as well as improved cutscenes and full voice-overs throughout missions and briefings. They both run well in DOSBox without major issues and don't require a joystick to play. Both feature the dynamic iMUSE MIDI music system. 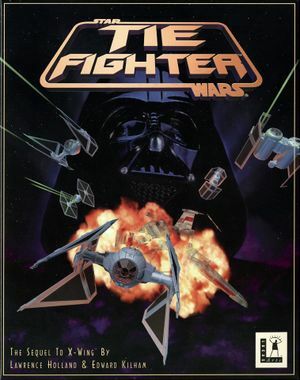 A bundle of TIE Fighter and X-Wing ported to Windows 95/98 and released in 1998. This version features further enhanced graphics, including 3D-acceleration support (Direct3D), the use of proper textures instead of primitive gouraud-shading and completely redone concourse graphics. The iMUSE dynamic music system, however, was removed in favor of conventional CD-audio tracks. Furthermore, this version requires a joystick/gamepad and cannot be played with a mouse unless joystick-emulation is used. The problems and fixes in this article mostly relate to this version of the game. The available digital copies of the game include the original 1994 DOS floppy disk version, the 1995 Collector's CD, and the 1998 Collectors Series edition Windows release of the game along with all expansions (1995 Collector's CD was added to the GOG.com version on 28 April 2015). They also have compatibility fixes for modern systems. Press Alt+↵ Enter if using DOS version in DOSBox. Use 3D-accelerated mode and force in the graphics card control panel (Windows only). Frame rate is capped at 35 FPS. DOS version only. Windows requires using mouse for menus. In the windows version, Buttons can be assigned from the in-game options menu (press Esc when not flying). Only the Dos version permits using the keyboard or controller to navigate menus. Only exception is robotic "Good work alpha 1", which is really a reaction to text that appears at the bottom. Menus only; in-flight prevents Alt+Tab ↹. This game supports the MT-32 and General MIDI for music (Floppy and DOS CD versions only). texts only in French retail version (collector cd rom and floppy) cinematic voices were dubbed only on the floppy version (extensions were never dubbed in french). Battle 6 mission 3 fix. Since the X-Wing and TIE Fighter installers are 16-bit programs they won't work in 64-bit operating systems. To remedy this, use the appropriate fixed installer found here:  to create an updated install disk with which you can install and run the game. Detailed instructions are found here: . When installing, the autostart menu seems to be bugged so you might need to run the setup.exe file directly from the disk you created. The digital release is updated to work on Windows XP and later. Extract it into your TIE Fighter folder. Run tie95fixedclear.bat. This should fix the graphical corruption. If all the ships/stations are invisible and the above fix doesn't work, and in case an ATI card is being used, the old DLL files (atiumd64.dll and atiumdag.dll) may fix the problem. It has been reported to work on Windows 8 64-bit with a 5870 video card. This seems to happen with some combinations of cards and drivers. I don't know of a fix other than to try a different driver. This happen if you use the DOS version in DOSBox. The firing rate seems to work opposite to the game speed. More Cycles = Less Laser Fire - Fewer Cycles = More Laser Fire. About 60000 Cycles for 640x480 and 30000 Cycles for 320x200 should be a good compromise. While digging through a cracked version of the .exe in search of entries related to in-game resolution I came across a few numbers that when changed gave interesting results. At one point the game was running at 1920x1200 with the menu as a square up in the corner, but upon entering flight-mode I would always get a crash. It seems playing in higher resolutions might be possible, but someone with a greater knowledge of hex-editing should probably take a look at it. iMuse (DOS), WinMM (Win9x) For music only. GOG.com version uses an OGG wrapper for WinMM. ↑ 1.0 1.1 File/folder structure within this directory reflects the path(s) listed for Windows and/or Steam game data (use Wine regedit to access Windows registry paths). Games with Steam Cloud support may store data in ~/.steam/steam/userdata/<user-id>/355250/ in addition to or instead of this directory. The app ID (355250) may differ in some cases. Treat backslashes as forward slashes. See the glossary page for details. This page was last edited on 15 April 2019, at 10:19.